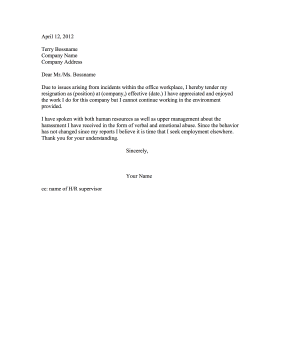 If you've been harassed in the workplace and no action is taken by management, then use this resignation letter to seek employment elsewhere. Due to issues arising from incidents within the office workplace, I hereby tender my resignation as (position) at (company,) effective (date.) I have appreciated and enjoyed the work I do for this company but I cannot continue working in the environment provided. I have spoken with both human resources as well as upper management about the harassment I have received in the form of verbal and emotional abuse. Since the behavior has not changed since my reports I believe it is time that I seek employment elsewhere. Thank you for your understanding.